There is nothing quite like a good story with a timely message. And there is nothing that enhances the Shabbos table more than an inspiring insight on the weekly Torah reading. This hard-to-put-down book offers a combination of both; an inspiring insight into the parashah illustrated by a great story. Rabbi Shimon Finkelman, author of ArtScroll's best-selling Shabbos Stories and More Shabbos Stories as well as other popular works, presents an all-new collection of true, inspiring encounters. He is a rebbe at Yeshivah Darchei Torah in Far Rockaway, New York. 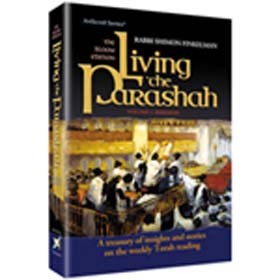 Much of the material in this book - the first of a five-volume series - is drawn from the popular shmeussen of Darchei Torah's Rosh HaYeshivah, Rabbi Yaakov Bender, and Rabbi Menachem Feiffer, a maggid shiur at Darchei Torah's Mesivta Chaim Shlomo.